The Urban Wood Network’s LinkedIn page (formerly Urban Forest Product Alliance) is your 24/7 source for news, inspiration and commentary from North America and beyond. As of this writing, the UWN’s LinkedIn community numbers 1,757 members. 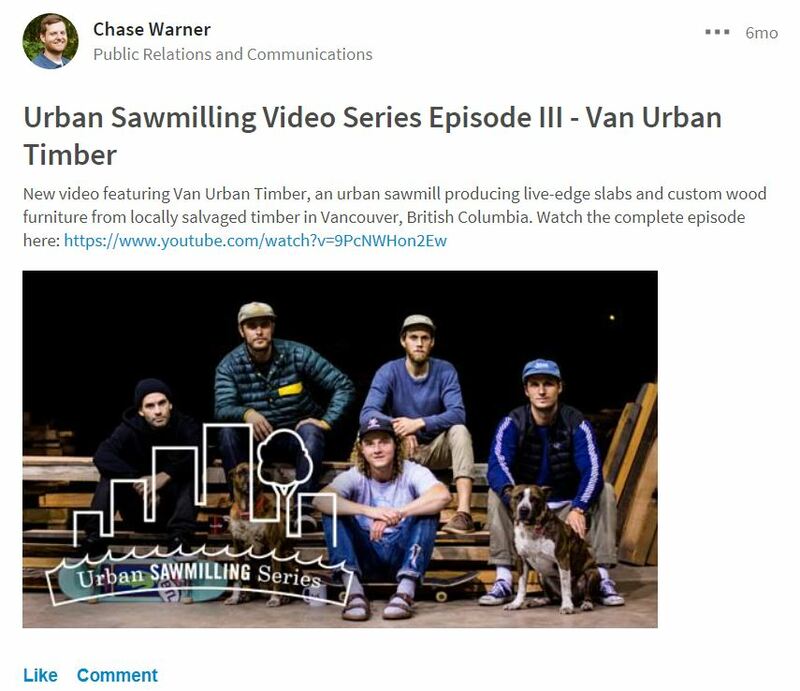 It’s a great resource for networking with your peers and finding new partners up and down the urban wood supply chain from arborists and sawyers through lumber sources and woodworkers. Woman Owned, Reclaimed Wood Furniture Manufacturing Business, Urban Wood Goods, earns FSC 100% Recycled certification, Woman Business Enterprise, WBE and WOSB. So what are you waiting for? If you are not already a member, dive in! A new study by researchers of the U.S. Forest Service estimates that U.S. urban areas are losing about 36 million trees per year. You can read a summary about the study, with a link to a more in-depth report, in this month’s Illinois Urban Wood Update. No doubt, I think its fair to say that a good number of these 36 million trees could produce lumber to make things. But I think it’s also fair to say that probably only a very small percentage of the lumber-bearing trees have had a date with a sawmill. The wasted opportunities to repurpose more of our felled and fallen urban tress points to the need for municipalities to incorporate urban wood utilization in their urban forestry plans. Some do, but far more don’t. Kudos to Edith Makra, director of environmental initiatives at the Metropolitan Mayors Caucus and former chair of the Illinois Wood Utilization Team, who authored the GRC. Meanwhile, the emerald ash borer has finally found its way into Vermont. 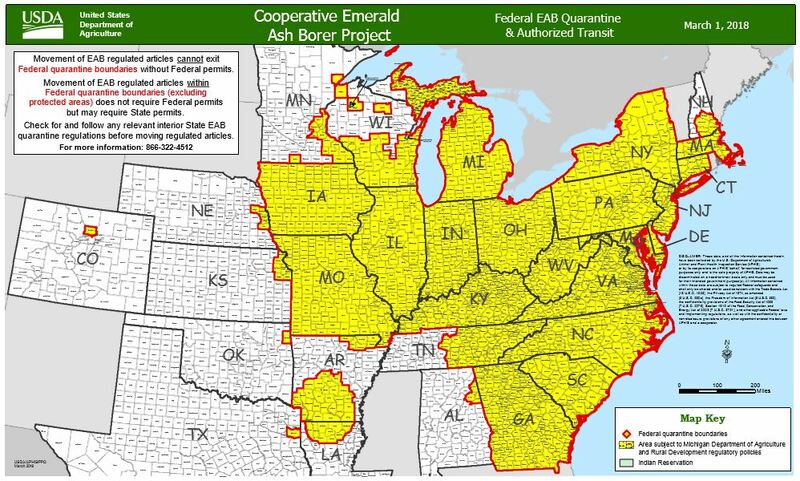 It’s amazing that it took this long considering how the EAB has ravished ash trees in surrounding states. As state foresters brace for the deadly beetle’s invasion, they are already considering how they might put some of the tree casualties to use. Finally, the free urban wood seminar being organized by the Urban Wood Network at the International Woodworking Fair in Atlanta, has three new sponsors. Richelieu Hardware, Dynabrade and Safety Speed Manufacturing have joined lead sponsor Wood-Mizer in supporting this special presentation at North America’s largest gathering of professional woodworkers. I’m looking forward to moderating the session, “The Urban Revolution Is NOW! Come Join the Movement,” scheduled for August 24 at the Georgia World Congress Center in Atlanta. The reception area of Bubon Orthodonists in Milwaukee has a decidedly local flavor, and for good reason. 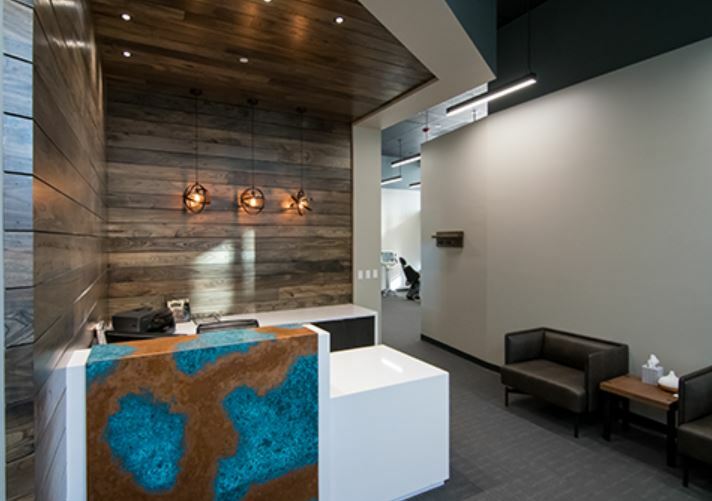 The backdrop of the reception counter is wall cladding made with Wisconsin urban wood. The reception area was designed by Rick Pipek of in.studio architecture also of Milwaukee. Wudeward Urban Forest Products, a member of Wisconsin Urban Wood, furnished the high-quality urban wood planks used in the project. Note: Wudeward owner Dwayne Sperber bill be a featured presenter of “The Urban Wood Revolution Is NOW! Come Join the Movement” seminar scheduled for Aug. 24 at the International Woodworking Fair in Atlanta. Lean more. A new study authored by David Nowak Eric Greenfield of the U.S. Forest Service concludes that the U.S. is losing some 36 million trees each year in U.S. metropolitan areas. 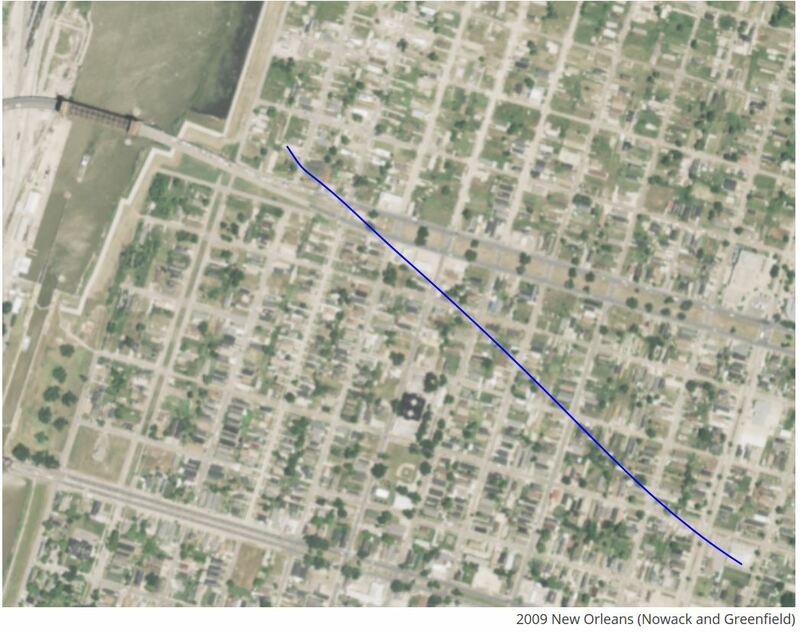 That equates to about 175,000 acres of mostly urban forest. The study, published in Urban Forestry & Urban Greenery, has been cited by numerous media and websites including Science Alert. The Science Alert article notes that the tree loss totals about $96 million a year in benefits such as removal of air pollution, sequestering carbon and conserving energy by providing shade to buildings. 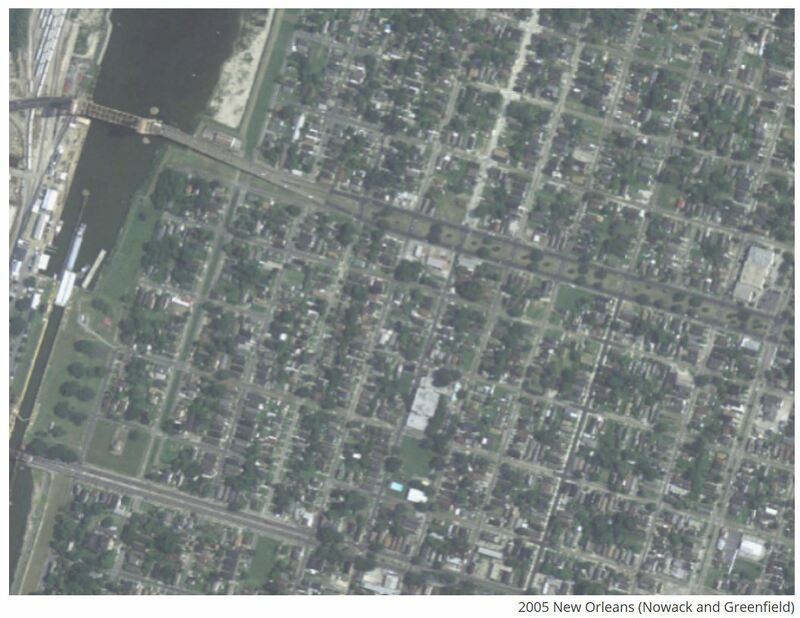 Urban development, catastrophic storms like Hurricane Katrina and insect infestation are among the culprits to the nation’s shrinking urban tree canopy. The researchers used paired aerial photographs from Google Earth to monitor forest coverage in 1,000 locations for each of the 50 states across the United States from 2009 to 2014, according to Science Alert. Read Science Alerts‘ full article. The Metropolitan Mayors Caucus announced that 95 Chicago-area communities that are members of the Metropolitan Mayors Caucus have signed the Greenest Region Compact (GRC). These communities will use the GRC as a guide to implement local actions that together will promote sustainability across the region with an emphasis on creating healthy, thriving communities. The GRC represents consensus goals that build vibrant and strong communities, and sustain healthy environments for people and nature. The common goals and practical strategies in the Greenest Region Compact come from an extensive study of what the 275 Metropolitan Mayors Caucus communities are already doing to be sustainable and what sustainability goals they have already set for themselves. Mayors contributed to and agreed to support these goals, tailored for municipal action, in ten areas that include climate, economic development, energy, land, leadership, mobility, municipal operations, sustainable communities, water, waste and recycling. “Mayors and community leaders really put their heads together to come up with the Greenest Region Compact. Now, communities of all sizes can benefit from this collaborative planning effort and leap ahead to take meaningful actions,” said Edith Makra, Director of Environmental Initiatives at the Metropolitan Mayors Caucus. The Greenest Region Compact assembled practical, achievable and meaningful strategies into a companion guide: the GRC Framework. This tool enables communities to evaluate their current environmental initiatives and guide future efforts. Communities that have adopted the GRC are now working together towards these common goals, using the GRC Framework to guide and track their progress.  Goal – Advance Renewable Energy: A national designation program, SolSmart recognizes communities that remove local barriers to solar energy and help grow solar markets. The Metropolitan Mayors Caucus led 12 GRC Communities and three counties to work together to earn SolSmart designation by streamlining local permitting, planning and zoning procedures, to make it faster, easier and more affordable for residents and businesses to go solar. Earning SolSmart designation helps municipalities prepare for solar development, an industry that is expected to grow in Illinois by 2,600 percent by the year 2030 because of a new state law.  Goal – Beautiful Landscapes That Are Good For The Environment: The remarkable and beautiful monarch butterfly is endangered and new habitat is needed to protect them. GRC Communities are helping to restore the monarch butterfly by creating landscapes where milkweed—a plant vital to the monarch’s survival—can thrive. These landscapes support other native plants that provide nourishment and shelter for other important pollinator insects and birds. Twentysix GRC Communities are working with volunteer groups to create pollinator habitats along railroad tracks, in subdivisions, in parks and around schools and municipal buildings. These gardens bring together residents of all ages to learn, work together and even enjoy honey from community apiaries such as those in Hanover Park and Westmont.  Goal – Energy Efficiency: Forty-four GRC Communities upgraded their own public facilities to reduce consumption of energy. To save energy and reduce carbon footprint, these communities switched lighting fixtures, upgraded ventilation, heating and cooling systems to maximize performance and energy efficiency. The Village of Schaumburg upgraded to high-efficiency lighting systems throughout their municipal facilities—from fire stations and Village Hall to the Schaumburg Airport to save at least $150,000 each year in energy costs. River Forest replaced nearly 900 streetlights with energy-saving LED fixtures, saving 638,000 kW hours a year—enough to power 70 homes for a year. The total energy savings by all GRC Communities working together sequesters 23,802,023 pounds of carbon dioxide (CO2). That is the amount of CO2 captured by 12,717 acres of US forests in one year. The Metropolitan Mayors Caucus is a membership organization of the Chicago region’s 275 cities, towns and villages. Founded in 1997, the Mayors Caucus pushes past geographical boundaries and local interests to work on public policy issues. The Caucus provides a forum for metropolitan Chicago’s chief elected officials to collaborate on common problems and work toward a common goal of improving the quality of life for the millions of people who call the region home. For more information, visit http://mayorscaucus.org . The Greenest Region Compact (GRC) promotes sustainability in Chicago communities across the region with an emphasis on building strong and vibrant communities. The foundation of the GRC are 49 high-level goals that have been reached by consensus; not only are the goals aligned with important local, regional, national and global goals, but they also have support from 95 communities that have adopted the GRC. GRC consensus goals guide municipal action, support mayors in their role as environmental leaders, and foster collaboration that will have positive impacts on the region. For more information, visit http://mayorscaucus.org/initiatives/environment/rec. The GRC Communities are: Algonquin, Algonquin Township, Alsip, Arlington Heights, Aurora, Bannockburn, Barrington, Batavia, Beach Park, Blue Island, Bolingbrook, Braidwood, Brookfield, Buffalo Grove, Burlington, Campton Hills, Carol Stream. Carpentersville. Cary, Chicago, Chicago Heights, Chicago Ridge, Countryside, Crete, Crystal Lake, Darien, Diamond, Elgin, Evergreen Park, Flossmoor, Fox Lake, Frankfort, Franklin Park, Geneva, Glencoe, Grayslake, Hainesville, Hanover Park, Hawthorn Woods, Hebron, Highland Park, Hillside, Hoffman Estates, Homer Glen, Indian Head Park, Island Lake, Johnsburg, La Grange, Lake Bluff, Lake Forest, Lakewood, Libertyville, Lincolnshire, Lincolnwood, Lombard, Long Grove, McCullom Lake, Midlothian, Minooka, Mokena, Mount Prospect, Naperville, Niles, Northfield, Northlake, Oak Brook, Oak Forest, Oak Park, Olympia Fields, Orland Park, Oswego, Palos Hills, Palos Park, Park Forest, Park Ridge, Plainfield, Polo, Posen, Richton Park, River Forest, Rolling Meadows, Round Lake Beach, Schaumburg, South Barrington, South Chicago Heights, Streamwood, Sugar Grove, Thornton, Waukegan, West Chicago, Westchester, Westmont, Wheeling, Winnetka, and Worth. Considering the emerald ash borer already has been inflicting damage in 31 states and two Canadian provinces, it comes as more than a bit of a surprise that Vermont has so far been spared. According to VPR News, the state confirmed its first sighting of the EAB in February in the town of Orange. The anticipated arrival of the EAB has state forest officials drawing up a battle plan to at the very least slow the EAB’s spread. In the video below, WPTZ NewsChannel5 interviews state officials and woodworkers who express their concern about the EABs potential to devastate the state’s tree population. Ash makes up about 5% of Vermont’s forests. Illinois fought and lost the war against EAB. In 2015, Illinois joined Iowa, Kentucky and Missouri in ending a quarantine that restricted the movement of cut, non-coniferous firewood within the state. Since its arrival in the Detroit area in 2002, EAB has killed tens of millions of ash trees, only a tiny fraction of which have been salvaged as lumber.